F1 is back after a miniature break between the Chinese and Spanish races, and we're ready for it. With the motorhomes returning, aerodynamics taking top priority and an intriguing set up for the "best of the rest" title behind Mercedes, it's about time that F1 got back into gear and gave us the fifth installment of the 2014 season. With that in mind, this is the place to keep on top of all that is happening across the weekend. With links, quotes, news updates and more, the rolling Factbyte Factbox will help you keep track of the Spanish Grand Prix from the first press conference to the last moment of the podium ceremony. I don't know about anyone else but this three week break has seemed like an absolute age. But never fear! 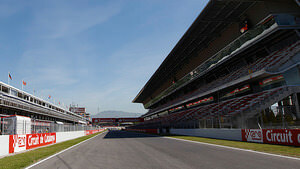 Formula One is back in action this weekend, with the Spanish Grand Prix at Barcelona. It's been a quiet mini-break, with drivers heading to their respective homes for a bit of rest and recuperation. The news has been scarce, but things are really starting to pick up now. Before we discuss what's been happening in the F1 world this week, make sure to gen up on the race this weekend with all you need to know in this handy information thread. 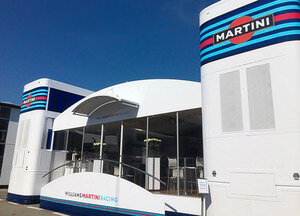 Williams launched their new pop-up experience this week, so called the "Esperienza". Located on the seafront in Barcelona, you can apparently get to hear the sights and sniff the smells of what it's like to be at the track. Interesting idea. The pop-up is only open for a few days across the race weekend, and Valtteri Bottas enjoyed it. "That was cool," he said. Meanwhile, in an effort to steal their thunder, Force India have been bigging up their new deal with Smirnoff. Although half the field are now sponsored by alcohol in one way or another, this tie up talks of responsible drinking and "the fan-centric alliance will be focussed on helping lovers of the sport get closer to drivers, nearer to top quality race action and further away from exclusivity." It was the media who got the first access, however, with a karting event to promote the new-look livery with added Smirnoff branding. @clubforce: "The racing is underway at our @Smirnoff event! It's media against team personnel - who will you back?" 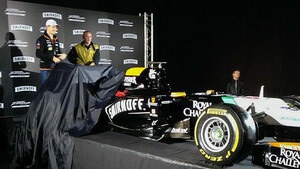 Team personnel won the event, (media must try harder), and then handed over to Nico Hülkenberg to reveal the logo. 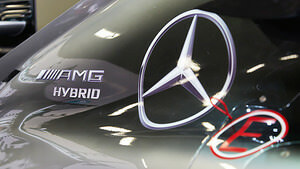 And talking of sponsorship, Mercedes are feeling pretty smug with a new sponsor on board called ebm-papst Group. They have clearly learnt their use of capital letters from Mr C.
emb-papst are a "fan and motor provider" in Germany, and have great credentials for environmentalism and sustainability. Toto Wolff highlights F1's attempts to be more green as a specific reason for emb's interest. "To welcome a new partner as a direct consequence of the new 2014 rules if proof that we are heading in the right direction. Our research and development for the race track is now increasingly relevant not only to our road car activities but also wider fields of technology." 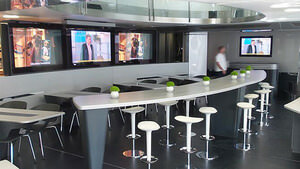 F1 is back in Europe which means a return of the paddock motorhome! Current cake status in Barcelona: One delicious looking birthday cake for Dani Juncadella, the Force India reserve driver turned 23 yesterday. Members of the Lotus team logged their walk around the circuit this morning. It took them just under an hour during which they averaged 2.9mph, maxed out at 4.3mph and burnt 280 calories in the process. Lacking significant title sponsorship in 2014, the McLaren team have had to downsize on hospitality this year. Tiny trees! Seriously, I need those in my life. 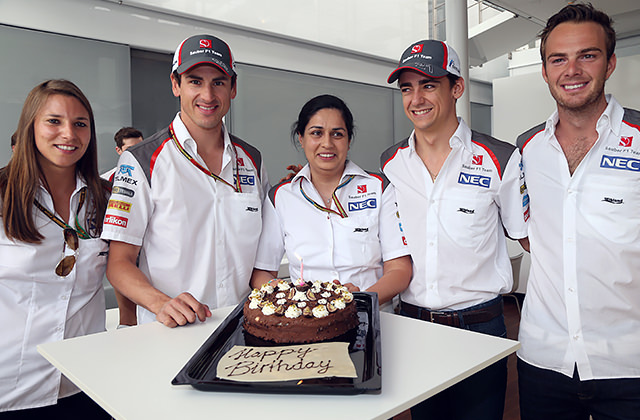 Cake status has been upgraded, Felipe Massa received a belated baked treat for his 33rd birthday a fortnight ago. It is impossible not to look like a dork wearing an Oculus VR headset, doesn't matter who you are, or how much you need the sponsorship money. 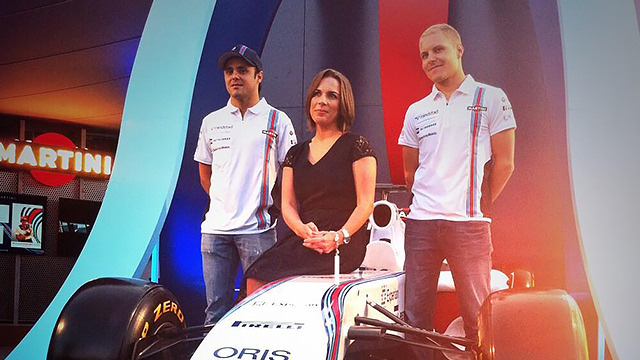 Poor Romain was subjected to such an indignity this evening at a Burn PR event for their new film Human Ignition. In the driver press conference today, Sebastian Vettel was asked about his recent drop in form and the decision to switch to a different chassis this weekend. "I think we concluded after China, where we were quite a little bit behind to change the chassis, so actually it's not a new chassis, it's an old one that we used in testing in the winter, and we have some experience with it. It is more a sanity check rather than a real problem with the other chassis. So it’s just to try everything we can and basically reset and start again." Sauber have brought a lighter chassis to this race and the weight reduction can't come soon enough for driver Adrian Sutil. Talking to media today he went into detail about his personal weight-loss experiments. "I was testing a little bit here and there. Two days with no food and only drink, I tried. It was not easy, but interesting what the reaction is. "I couldn't do much sport because the power was missing. I did it because I wanted to see and go on the limit to make sure I did my maximum. I don't want to be in the car and say I could have done more. I like to be on the limit and if it's not enough I go really hard on the edge. I tried it, but I'm still alive, don't worry too much." You can call the rookie of the year competition off right now, because according to Toro Rosso team principal Franz Tost, Daniil Kvyat is the man and he doesn't need to sit through a whole season to be sure. "[Kvyat] has shown that he is an extraordinarily skilled driver with a very high natural speed. In addition to his passion for motorsport, his interest in the technical side of racing, the fact he asks all the right questions, his discipline and his ability to form his own ideas of how to improve his performance - all combined, these are indications for me that we have a driver who is bound to be successful." Beautiful blue skies above the Barcelona paddock today. Two Free Practice sessions are scheduled, ninety minutes apiece. If you're watching any of the action, do join the live comments and say what you see! Lewis Hamilton picked up where he left off at the last race, by topping the timesheets in the first practice session today. At the other end of the scale Vettel spent the majority of the morning sat on the sidelines, after an electrical issue brought his running to an abrupt end. Second practice offered no change at the top as Hamilton again dominated proceedings. The session was notable for the sight of Jean-Éric Vergne losing his right rear wheel, and Max Chilton losing his mind and then the car in the gravel. See who finished where on Friday with the final times from Free Practice 1 and the same from Free Practice 2. Andrew Green was asked how Force India are going to keep the momentum from their great start to the 2014 season. "We're going to concentrate on the aerodynamics. It's still where the performance lies. We've still got some work to do on suspension, I think we're lagging a bit behind on some of the quite complicated link suspension systems that we know other people run, so there's a lot of work going on with that as well. "We started introducing some complex systems on the car in China, we've got to develop that as well. We do what we can with what we've got and sometimes you just have to take a bit of an educated guess at what you think is good, and go with it." Just a couple of sessions into the weekend and tyres are already causing controversy. 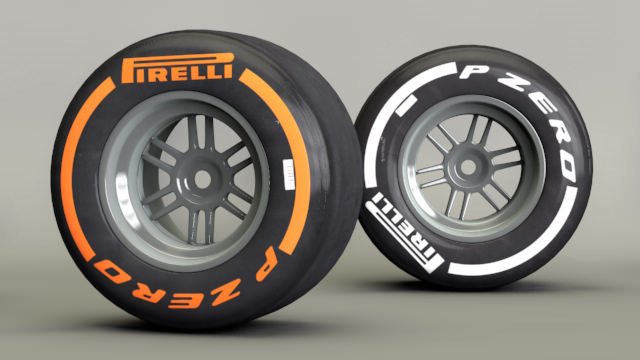 With the two harder compounds on offer in Spain, drivers are worried that Pirelli may have picked the wrong selection. Home favourite Fernando Alonso says simply "the tyre choice here is too conservative for this track." Meanwhile, Sergio Pérez is slightly more hysterical about the situation: "I think Pirelli need to be more aggressive with the compounds because we are going to have a race where everybody follows each other and it will be a boring race that's not good for the sport." Renault Sport are having a mixed time of it at the moment. They've released some statistics from Friday at Barcelona, with mostly positive things highlighted and no mention at all of Sebastian Vettel's issues. However, the engine manufacturer have also revealed that some of the teams are late in paying for their power unit supply and that is having an effect on their own ability to develop and gather resources. Without pinpointing a particular team, Renault's F1 president Jean-Michel Jalinier said: "It is a serious concern. We can live with it up to a certain point, because we are developing, putting money in the business, and we need to get our resources." Four teams are currently supplied by Renault - defending champions Red Bull and their sister team Toro Rosso, former Renault works team Lotus, and former Renault road car partners Caterham. Jean-Éric Vergne's second practice session came to a halt just four minutes from the end when his right rear wheel came off. It parted company with the rest of the Toro Rosso car at turn one, directly after a pit stop. The stewards have looked into it and determined an unsafe release, which unfortunately for Vergne means a grid penalty is imposed. Vergne will drop 10 grid positions from wherever he qualifies tomorrow, and because it was more the fault of team than driver, Toro Rosso were fined €30,000. Mercedes have gone all in on the new regulations, celebrating Formula 2014-style by rebranding their car. Now known as the F1 W05 Hybrid, the car will feature said hybrid logo on the side to celebrate all the energy saving going on. Catch up with the story in just sixty seconds. As Mercedes say: The engine is no more, long live the Power Unit! F1Minute also rounds up Vettel's struggles in Spain so far. Having brought a different chassis to the track, the German was likely hoping for better luck than just four laps on Friday. @adamcooperF1: FIA will check the wheel retention systems of not just STR but the whole field tomorrow, before FP3, for compliance with regs. Final practice offered no major surprises, with Mercedes on top, although it was Rosberg fastest this time. The top times for each session so far show the times are about five seconds off the pace of qualifying last year, with pole position in 2013 set by Nico Rosberg - 1:20.718. Tweet from‏ @tgruener of auto motor und sport: Rosberg quietly signed a contract extension till 2016 before the season. So no Alonso at Mercedes! Saturday morning may seem like an odd time to announce a major team reshuffle, but that hasn't held back Caterham. The team detailed senior management changes this morning, including the exit of Mark Smith and the promotion of John Iley, Jody Egginton and Gerry Hughes. Team principal, Cyril Abiteboul: "After investing last year in our new factory, and over the winter in aerodynamic development capacity, the new structure gives three specialists we are lucky to have with us the opportunity to use their experience, passion and dedication to help us progress. We are not happy with our current performance levels and John, Jody and Gerry, with my full support and that of our shareholders, staff and partners, are the right people to help take us forward." Qualifying is done and dusted, and while the result at the top may not have been a surprise, there was plenty to interest throughout the rest of the grid. The Factbyte Factbox caught all the action, if you want a recap, or you can head straight to the results page for an overview. Sebastian Vettel brought out a red flag during qualifying, when his car stopped on track with a gearbox issue. The defending champion is desperately trying to hide his frustration, as he told Sky Sports News: "There's not much I can do. Of course it's disappointing and by now a bit boring because we've had all sorts of problems, but the race is tomorrow. We still managed to get in Q3, we are tenth so still anything can happen tomorrow and hopefully there is no damage to the gearbox." Five drivers were randomly selected by the FIA to undertake anti-doping tests following qualifying. Maldonado, Sutil, Hülkenberg, Vergne and Grosjean all got the call today. Vettel's weekend gets a little worse as stewards confirm this morning that he will take a 5 place grid drop thanks to a necessary gearbox change. There is better news for Maldonado, who has been given permission to start the race despite failing to set a qualifying time. See how the whole grid will stack up Sunday afternoon with our starting grid information. You can take part in discussion on Sidepodcast during today's race via the live comments. We hope to see you there! What a race in Spain. It had its lull, sure, but the start was great and the end even better. If you want to catch up on any part of the race itself, I recommend the highlights post. Lotus picked up their first points of the year this weekend, helping put them on the standings board. No one is near Mercedes, though. In the driver's championship, Hamilton has moved into the lead, but there's still just three points in it. Not a bad race in terms of attrition, just two retirements. Jean-Éric Vergne had an exhaust problem and Kamui Kobayashi ended his race early due to brake failure. View the full finishing order here. You know you love airing your views on the racing action, and we have just the thing for you! Rate the race is asking for a score out of five for the action itself, two specific points from the afternoon regarding tyres and radio, plus who your driver of the day is. Get voting now! The latest edition of Grand Prix+ is available to download for subscribers. Romain Grosjean bagged his and Lotus' first points of 2014 this weekend, and he managed it while fighting the car almost all the way. Around lap 12 the car developed a sensor failure that affected amongst other things, power delivery. Overall though the Frenchman was happy with his result. "We suffered a little bit with the temperature being cooler and the track being a little bit green, but in general it's all good and we all deserve a cold one!". Underachiever of the weekend features close competition between the Toro Rosso and Sauber teams this week. STR appear to have lost all of the pace they showed in opening races, only managing to scrape a 14th and a last place for the efforts in Barcelona. Sauber meanwhile arrived at the circuit with a significantly lighter chassis, which should have delivered major performance benefits, yet they only managed to roll in 16th and 17th. Team principal Monisha Kaltenborn notes that this year's Pirellis are giving them the most trouble, "We have to get a more profound understanding of how to best use the tyres." 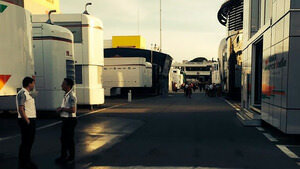 @WilliamsRacing Strangely calm in the paddock for a race day evening! We will be back here tomorrow ready for testing this week! Nico Rosberg has recorded his usual post race video. Interestingly he blames a bad getaway at the start for ultimately failing to get the better of Hamilton. A decent launch off the line is essential at the next race in Monaco, so maybe something to keep an eye on. A sixty second round-up of the race should finish us off nicely: Hamilton and Rosberg fight to the line for Spanish GP win. That's all for this weekend's logbook, it's been a lot of fun keeping up with all the action from the paddock - it seems like there are always a few more things going on once the teams break out the motorhomes. 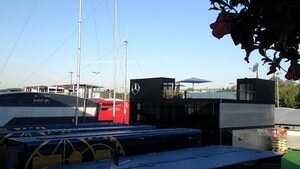 The logbook will be back in about ten days when we start gearing up for the glitzy Monaco GP! See you then.